With the approach of May is Cinco de Mayo and this dairy-free creamy Mexican dip is a great way to celebrate! It’s healthy, spicy and festive! 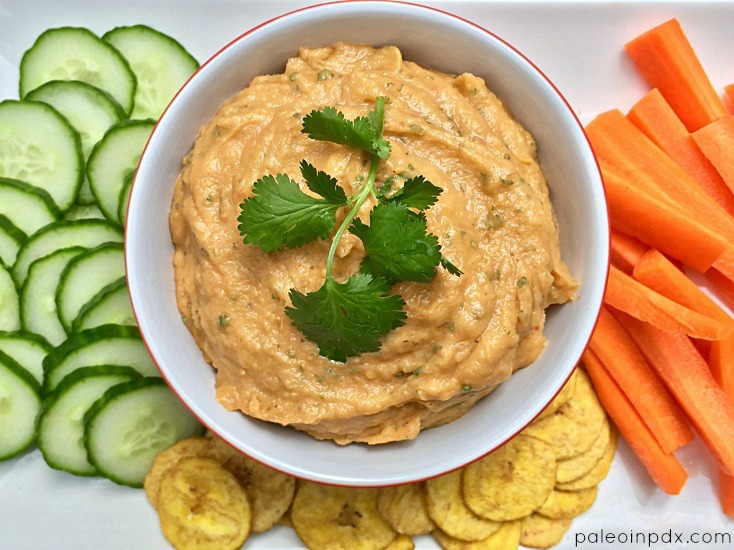 I enjoyed eating this dip with veggie slices, plantain chips, and mixed into a taco bowl too. There is no dairy in the dip, but the creamy aspect comes from pureed white sweet potato, olive oil and avocado. It’s wonderful served warm, room temperature or cold. This recipe yields a lot too! Also, I’ll be making this dip on KATU Afternoon Live next Wednesday, May 3rd. Watch the replay of my segment HERE! This flavorful dairy-free creamy Mexican dip whips together in a flash and is perfect for parties, get-togethers, barbecues and more. It even has a hidden dose of veggies that adds to its creaminess! Cook sweet potato cubes in a steamer basket over medium heat for about 10 minutes or until tender. Add the cooked sweet potato to a food processor with the garlic, avocado, lime juice, olive oil, sea salt and black pepper. Blend until smooth, scraping down the sides with a spatula as needed. Next, add the salsa and cilantro, and pulse several times to incorporate it into the sweet potato mixture. Taste and add pinch of cayenne (or more) if you want it a bit spicier. Serve warm, at room temperature, or cold with sliced veggies, plantain chips, grain-free tortillas, or grain-free tortilla chips. It also makes for a tasty topping on tacos, salads, etc.